Dr. Jane Lubchenco is an American marine ecologist and environmental scientist specializing in oceans, biodiversity, sustainability, human-environment interactions, and climate change. Dr. Lubchenco studied at Colorado College, the University of Washington, and received her Ph.D. in ecology from Harvard University in 1969. She taught for a short time at Harvard and then from 1977 to present at Oregon State University as a zoology professor. 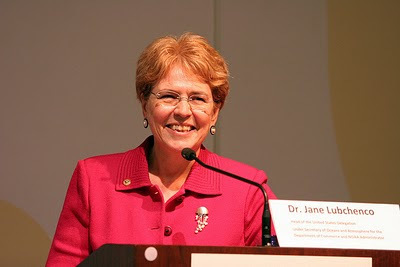 Dr. Lubchenco served as president of the American Association for the Advancement of Science for a year in 1997 and has received numerous awards, including a MacArthur Fellowship, a Pew Fellowship, a Heinz Award in the Environment, AAAS Award for Public Understanding of Science, the Zayed International Prize for the Environment, and the Nierenberg Prize for Science in the Public Interest. She has co-founded several nonprofit organizations and has served on many national and international councils and commissions. Dr. Lubchenco is a passionate advocate for science guiding public policy and is a frequent commentator on radio and television. In 2009 she became the first female administrator of NOAA. In her rare free time, she enjoys hiking, bird watching, traveling, dancing. 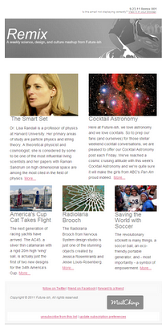 Future-ish added Dr. Lubchenco to our PISA List in 2010.